At first sight it looks like a giant Airfix model, with every detail carefully replicated, from the tiny fighter jets and helicopters to the unique twin ‘island’ control towers complete with a captain and commander to survey the deck. Even the 30mm anti-aircraft guns and the long-range radar have been painstakingly reproduced. At more than five feet long, the model is a carefully crafted reminder of our glorious naval past carved out of grey plastic. Such vast aircraft carriers may once have been a badge of pride, but now you can’t help but feel they are merely lumbering relics of the Cold War or even the Empire, which have surely had their day. After all, the UK abandoned the idea of aircraft carriers in the late Seventies when our last big carrier, the HMS Ark Royal, was scrapped. But this long hunk of plastic represents a work in progress. It sits proudly in the lobby of the design headquarters for the Royal Navy’s latest grand project. It’s a 1:200 scale model of what will be the two biggest warships Britain has ever launched – the 65,000-ton HMS Queen Elizabeth and HMS Prince Of Wales. Each ship will have nine decks topped by a vast flight deck and will tower six metres taller than Nelson’s Column from keel to masthead. ‘Cover the flight deck with grass and it would be a par four,’ says one of the design team. They will carry 36 state-of-the-art Joint Strike Fighter stealth jump-jets and four helicopters each, and be able to get 24 planes airborne within just 15 minutes. ‘All the major navies in the world are now building them,’ says Dr Lee Willett, head of the Maritime Studies Programme at the Royal United Services Institute. ‘The Russians have one of their big carriers, the Admiral Kuznetsov, back at sea and have stated that they plan to build 12 carrier battle groups. 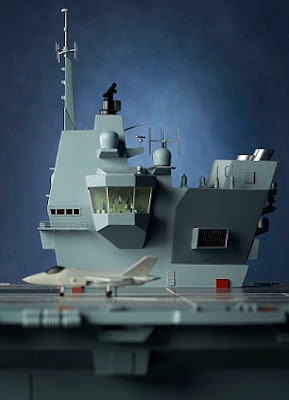 The Chinese and the Indians are also under way with plans, the Japanese are building a destroyer that will act as a helicopter carrier and the US are working on new-generation carriers. What the building of the carriers also shows is that Britain is running out of friends. Former naval officer and now author Lewis Page agrees. ‘Friendly nations are hard to find and it becomes even harder once you have taken over local air bases, which are then vulnerable to attack. 'But there is a way to avoid giving yourself a logistical nightmare and becoming a target. Without having to ask anyone you can put an aircraft carrier 15 miles offshore in international waters and carry out operations from there without a single person needing to set foot on land or a single supply convoy coming under fire. Despite the persuasive arguments, our two supercarriers have had a long and painful birth. The decision to build them was announced in the 1998 Strategic Defence Review, but the official signing ceremony only came a decade later, in July this year. 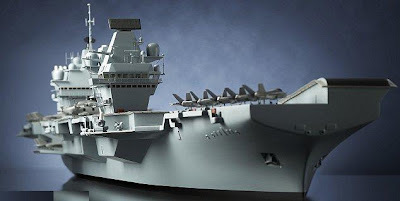 Now the Defence Secretary has announced the carriers will be further delayed – they are not expected to be ready for final delivery until 2016 and 2018. Meanwhile, work continues at Rosyth dockyard on the Firth Of Forth to expand the granite sides of the massive Number One dock. It is here that the final assembly of the carriers will take place – or at least, that’s the plan. But there are troubled waters ahead for this huge project, which still has the potential to go spectacularly wrong. Britain has never put together a ship in this way, on this scale, and there are fears over whether we have the commitment or the skilled workers to build the vessels to order and on time. There have been criticisms of cost-cutting measures, concerns linger over whether the engines will work and, just to add to the uncertainty, the planes it is hoped will fly off the carriers have yet to be built. From the outside it looks like any other nondescript provincial HQ, with a few well-manicured bushes and rows of family saloon cars parked neatly in front. But it’s on this unassuming industrial estate in suburban Bristol that the Royal Navy’s latest strike force is being designed. Live has been given exclusive access to the design team, to watch them at work on blueprints and on computer designs for the new carriers, the UK’s most impressive piece of military kit for decades. Within the open-plan office there are 180 people, among them 150 designers. I’m introduced to the design team in a meeting room, on one wall of which are pinned rows of detailed diagrams of the nine decks of the CVF (CV is the hull classification for a Carrier Vessel, while F stands for Future). We are prohibited from taking pictures as the diagrams are protected by the Official Secrets Act. ‘The project has been going for ten years and this is the third ship we’ve worked on,’ says naval architect Simon Knight, the project’s Platform Design Director. In the past, the team would have had to build life-size sections in plywood, but today most of the design and simulation is done on computers. Eddie Chambers, from Tyneside, is responsible for the intricate CAD (computer-aided design) 3D models of the ship. Built up in meticulous detail, these even show individual pipes and electrical cables. He offers me a virtual tour of the engine room, then calls up one of the mess halls, complete with tables and chairs. No single shipyard in this country has the infrastructure or personnel to construct the entire ship, so the plan is to build them in sections in different shipyards. Work on the lower bow section has already begun in Devon. The other shipyards are set to begin cutting steel in March 2009. The aft block will be built in Glasgow, the central block in Barrow-In-Furness and the forward section in Portsmouth. The remaining upper sections will be constructed in smaller docks; bids from shipyards are still being considered. The blocks will then be transported independently to Rosyth to be put together. The integration process is scheduled to take around two years and the plan is that as soon as the first ship floats it will leave and then work will begin on the second. Putting aside questions over whether the money or political will could dry up before these carriers are completed, simply the practicality of gathering the parts together is a logistical nightmare. ‘Transportation is one of our biggest problems,’ says Knight. ‘Ideally you would build part of the ship in a dock, flood the dock, float the section of ship out and tow it to Rosyth, where you float it into another dock and let the water out so it’s left resting on blocks. You then connect it to the next section. ‘But unfortunately the aft section doesn’t float. We’ve looked at barges to transport it, but there’s only one big enough to take that weight and who knows if that barge will be around when we need her. If and when all the pieces do finally meet, then putting the thing together should be like assembling a Lego model. But this is a massive undertaking – each of these gigantic blocks will weigh up to 10,000 tons. ‘Joining these enormous sections together, physically hammering them along a block and then making sure they’re exactly aligned will be a pretty hairy operation,’ says Knight. The procedure has been carried out before to build offshore rigs, and the Navy is using it for its Type 45 destroyers, but those are small projects compared to these monsters. Each of these blocks will be bigger than a Type 45. Even if things run smoothly this far, there are no guarantees that the ship will actually move. Simon Knight admits that nervousness will continue until the moment that HMS Queen Elizabeth finally goes into the water. 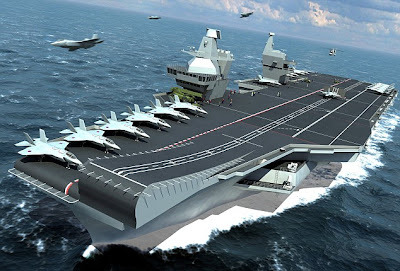 The £3.9 billion cost for two carriers may seem huge, but they are built to serve for 50 years, and the budget is significantly less than for American carriers – each new ship costs $14 billion (£9 billion). The project team admits that designing a ship with the desired features to a tight budget has been challenging. The result, they say, is notable more for simplicity and efficiency rather than hi-tech innovation. The most revolutionary element of the CVF design is its highly mechanised weapons handling system, which means a cut in the crew numbers required – from 4,500 on a US carrier (including a team of 150 just to move the weapons around) to 1,450. One of the first things to go was nuclear power. Most modern aircraft carriers, including the American ships, are powered by an on-board nuclear reactor. ‘This is a brand-new ship, so getting through all the safety aspects of nuclear power would have been hideously expensive,’ says Knight. Instead, like modern cruise liners, the HMS Queen Elizabeth and HMS Prince Of Wales will be propelled by electrical motors, powered by two Rolls-Royce gas turbines and four diesel generators. The diesel generators are more economical and used for general cruising, but when you need to get somewhere fast or need more headwind to help the planes to take off then you switch to the gas turbines. Money has also been saved in side armour protection, though Knight insists this was a strategic rather than a budgetary issue. That would be fine except that the Joint Strike Fighter (JSF) jump-jets requested are still in early flight tests and engine problems mean they will not even attempt vertical take-off until next year. Areminder of the worth of aircraft carriers as mobile airfields was provided by the Falklands War in 1982. HMS Invincible and HMS Hermes had been built as ‘through-deck cruisers’, to carry hunter-killer groups of Sea King anti-submarine helicopters, which were capable of tracking down and destroying Soviet subs in the north Atlantic should the Cold War ever spill over into open conflict. The four or five Sea Harrier planes also aboard were simply there to protect the ship from attacks by other aircraft. But then the ships were hastily reconfigured to carry eight Harrier jets in the Falklands crisis, and they proved invaluable in getting air power over their targets. In these turbulent times, ‘power projection’ is once again considered a necessity. As complications over finding host nations and even getting agreement on using air space grow, so does the value of the carrier, which has been vital in the ongoing war in landlocked Afghanistan. ‘That started out as a carrier-based operation,’ says Dr Willett. ‘Finding shore bases can be politically difficult, and there’s also the question of whether they are of a sufficient standard. Upgrading them can be politically difficult and expensive. Carriers have proved their value in humanitarian and relief operations as well as in combat roles, and they remain a very flexible political and military asset. Even if it’s not politically desirable to put troops ashore somewhere, you can fly aircraft overhead, use some ordnance against a specified target, or just deliver a warning simply by having a carrier parked offshore. • Two huge lifts, each with a 70-ton capacity, are capable of transporting two aircraft from the hangar to the flight deck in 60 seconds. The ship will be home to 36 Lockheed Martin F-35B Joint Strike Fighters and four EH-101 Merlin helicopters. • An onboard water treatment plant produces over 500 tons of fresh water daily. • Two Rolls-Royce MT30 gas turbines and four diesel generator sets produce 109MW - enough to power a town the size of Swindon.